The relationship between dreams and ice cream was imprinted on me in childhood: the perfect way to see through the end of a summer day to tomorrow's possibilities. When I walked into the Dream Cream, *every person* behind the ice cream counter looked up and greeted me. One of the servers eagerly told me about the business' mission—to help realize the dreams of others by opening their space to community crowdsourcing initiatives. Anyone can submit their dream and volunteer to serve ice cream for their cause. On that particular day, the flavor of the week (chocolate chip cookie dough, my favorite) promised its earnings to help young students in the community. 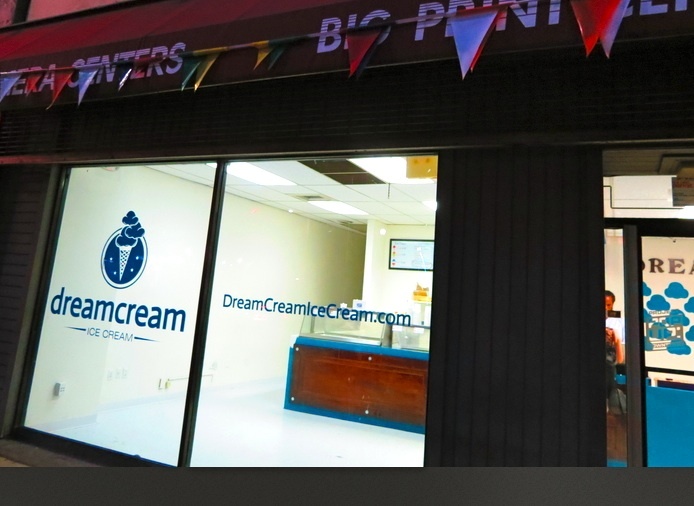 I recently read about and wanted to visit Dream Cream (co-owned by Alecia Shipman and Thomas Jamison) because I knew that One Large's project was to acknowledge and support local black-owned businesses as essential resources for a community's success, growth, and identity. The Dream Cream Ice Cream parlor struck me as a business that not only exists in downtown's fluid community but also exists *for* the community. They're in constant conversation with others, whether in the parlor or via social media, about what can be done to make our shared spaces better and what positive actions we could take to make others' goals more obtainable. Dream Cream is an example of what's possible (anything & everything) for a small business in a city with a fraught economic history, especially with respect to black communities. I'm proud to have Dream Cream in our Pittsburgh community, and am inspired.